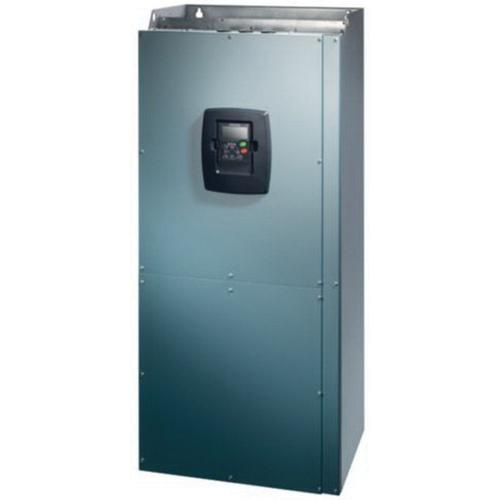 Eaton Adjustable frequency AC drive has low ripple in the torque and is perfect for multi-motor drive systems. This adjustable frequency drive is used with 3-Phase motors for industrial applications. It has voltage rating of 380 to 500-Volt AC and current rating of 261-Amps (low load), 205-Amps (high load). This drive provides high immunity to resonance vibrations. It has a hp rating of 150 hp and 200 hp. NEMA 1, IP21 enclosure is used for general-purpose indoor use. Drive is UL listed, CE certified and meets EN/IEC standards.